When doing laundry at home, the key to going green is using less. It only takes two tablespoons of detergent to get your clothes clean, so avoid using more (and save money on detergent!). Use cold water when possible, saving warm water for heavily soiled clothes and always using a cold rinse cycle. Only run a load when it is full (or adjust the water level to accommodate smaller loads) so you don’t use excess water. Check out this chart for more tips for greener laundry. Your dryer is one of the least efficient appliances in your home. It takes a lot of energy to heat and dry your clothing. If you have the option, line drying your clothes (outside or using an indoor rack) is a great alternative to using the dryer. Not only can line drying keep your clothes looking their best and lasting longer, the sun can actually make your whites brighter! For all your dry cleaning needs, the green solution is obvious – organic wet cleaning! Traditional dry cleaning relies on the harsh solvent Perchlorethylene to clean your clothes. It is such a harsh chemical that it must be sealed in drums after use and hauled away as a biohazard! Perc is also used to degrease auto parts and strip paint, so how can it be good for your clothes, your body, or the environment? Organic wet cleaning is the environmentally friendly alternative to traditional dry cleaning. Instead of harsh chemicals, organic wet cleaning relies on temperature controlled water, gentle detergents, and individualized care for your garments. With our computer-controlled process, we can precisely manage the temperature, pH levels, moisture content, and agitation to effectively clean your clothing – without harming you, your clothes, or the environment! Our work doesn’t stop when your clothes are clean. We also use special cleaners to make your garments resistant to stains. When you bring your clothes to us, you will get cleaner, healthier, and greener clothes than dry cleaning. Your clothes will not only look and feel better, they will also last longer, saving you money and protecting your investment! Stop by our cleaners in Highlands Ranch or give us a call at 303-798-0515 to learn more about organic wet cleaning and see the green care difference for yourself! With a few simple changes to your routine, you can make a big difference and do your part to help the environment! Have you ever put on your socks and thought, “Gee, these used to be a lot whiter. I guess it’s time to get some new ones?” It can be a hassle to keep your whites white, so Green Care Cleaners has a method to help you prolong the life of your white socks which, in turn, will put some extra cash back in your budget. 1. Always make sure your socks are right side out. A common misconception is that both sides of a sock will be equally washed regardless if it is inside out or not. Since most of the dirt will collect at the bottom of the sock, being mindful of the correct position of a sock will get them as white as possible in the wash.
2. In a bucket, add two tablespoons of dishwasher detergent to a gallon of hot water. You can then add your load of WHITE SOCKS ONLY to the bucket, adding more water and detergent depending on the size of the load. Let them sit for at least two hours afterwards. 3. After they’ve have finished soaking, wash the load of white socks separately as a small load and finish them off in the dryer. Each New Year is an opportunity to look back on the previous year and make plans for the year to come. For many, that involves a Resolution. These sometime lofty goals are meant to inspire and guide change, but so many seem nearly impossible to keep. Have you already broken your New Year’s Resolution? Get rid of the clutter. That dress you haven’t worn in years, the extra shoes for “emergencies,” the mismatched socks or the pairs with holes… sort through your wardrobe and say goodbye to those unnecessary pieces. Donate. If you’re feeling separation anxiety over the like-new pieces that you never actually wear, donate to a local charity. You’ll be helping people in need with nice clothes and clearing space for the garments you love. Let them breathe. Avoid overstuffing your closet or dresser drawers. By giving your clothing extra space, the air flow can help prevent musty smells, wrinkles, and damage when you’re not wearing them. Wash smart. When you’re doing laundry at home, plan ahead for more efficient loads. Pair like colors, wash full loads, and do your loads back-to-back for more efficient washing and drying. Organize the closet. Make this a separate mini goal, or wrap into the earlier suggestions. You’ll be able to find the clothes you love earlier (while uncovering the hidden gems your forgot and the clutter you can clear). Treat stains. Don’t let a stain set. As soon as you notice the stain, have it treated and cleaned right away. If you wait too long, the stain may become harder to remove and the fabric can be damaged. Call us right away for advice: 303-798-0515. Pack with care. When you pack clothes for storage, make sure they are clean and dry! Pack with care and acid free paper to keep them safe when you’re not using them. Follow Care Instructions. The guidelines on the tags help you keep your clothes in the best condition and avoid damage during normal washing. Dry Clean. For your best garments, leave the cleaning to the professionals! Don’t risk damage by washing in your home machine or in conditions you can’t precisely control. Fresher, cleaner, longer lasting! Our experts and wet cleaning method can give you the best care for your clothing. We’re always available to answer your questions about your clothing, treat stains, and provide the best cleaning for your favorite garments. Give us a call at 303-798-0515. What are your clothing resolutions for this year? Let us know on our Facebook page! For many Coloradans, the best thing about winter in our great state is Ski Season! Whether you enjoy skiing, snowboarding, snowshoeing or you are a sledding enthusiast, you probably rely on warm winter sports clothing to keep you dry and warm while partaking in your favorite activities. Keeping your snow pants, ski jackets, and your warmest layers looking and performing their best requires regular cleaning and care. For best performance, it’s recommended to clean your gear at least twice per season. Gore-Tex shells have been known to last and keep their technical abilities for 30 years with proper care. And with the cost of a new jacket costing upwards of $350-500, the regular care is the cost-efficient way to achieve longevity and extend the life of your quality winter gear. In order to keep you warm and dry without trapping in perspiration, most ski wear is treated with special finishes to be both waterproof and breathable. 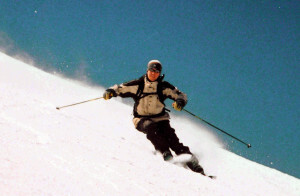 Ski wear and active winter jackets are typically coated with a water repellent finish. This coating has tiny holes that allow water vapor (from your sweat and body perspiration) to escape. At the same time, the holes are so small they prevent liquid water from getting through. As you use your ski garments, dirt, grime, and body oils can get trapped in these holes and obstruct the finish from working properly. Clogged pores trap your body heat inside the garment, while the dirt and grime can wear down the finish. Periodic cleaning will keep your jacket looking and performing like new! Removing the accumulated dirt will open up the holes in the finish again to restore water proof properties and breathability. Between washes, use a clean, damp cloth to brush away any visible dirt and stains. Always remember to hang, air out, and dry your ski wear completely before storing. If you wash your ski wear at home, always follow the care instructions on the label. Avoid using heavy detergents, bleach, and fabric softener, and DO NOT dry clean. The harsh chemicals will damage the water proof or resistant coating on your best gear. Our organic wet cleaning is a safe alternative for your ski wear, without the harsh chemicals that typical Dry Cleaners use. Your ski gear will be fresher, cleaner, and last longer! With proper care and cleaning, your winter sports clothing and ski wear will last from season to season. Call Green Care Cleaners at 303-798-0515 if you have any questions regarding maintenance of your clothing at any time of year! As the temperatures start falling in Highlands Ranch and the holiday season is near, we wish you warm and cozy gatherings. Winter in Colorado means sweater weather! Whether you wear sweaters every day or are preparing for an “Ugly Sweater” party this winter, proper care can keep your favorite winter garments in the best condition all season! Wool is a common material used for winter sweaters because of its warmth. Merino, Shetland, and Lambs wool are great sweater material, but can be difficult to care for at home. Wool garments can be easily damaged by heat, water, and cleaning chemicals like bleach. Instead of washing at home, bring your wool clothing to our organic cleaners for proper care. Cashmere is extremely soft and lightweight, yet warm and delicate. These sweaters are often expensive. This material makes the most luxurious sweaters. Whether you save them for special occasions or treat yourself to this comfortable fabric, proper care is extremely important to protect your investment. Cashmere sweaters should not be washed by your washing machine at home. The fabric must be handled with care to avoid twisting, wringing, and damaging the fibers in the fabric. Bring your cashmere items to Green Care Cleaners to avoid damaging the shape and feel of your favorite sweater. Cotton is a very common material for clothing in general, including sweaters, because it is durable and lightweight. While fall temperatures are changing, cotton is a good option for staying warm and comfortable in unpredictable temperatures. Cotton typically can be cared for at home, but use caution. Cotton garments are more likely to lose their shape. Dry flat and store in a drawer, not a closet, to avoid stretching out the fabric. Other sweaters are made from blended materials or a mix of multiple fabrics. 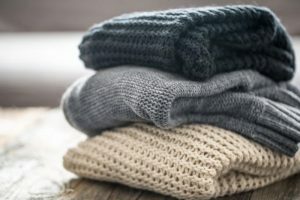 For more advice on proper sweater care and washing your specific sweaters, bring your garments into Green Care Cleaners in Highlands Ranch or call our clothing experts at 303-798-0515. Find Halloween Costumes in your Closet! It’s hard to believe that Halloween is almost here. The seasons fly by in Colorado! As you’re preparing for this year’s festivities, here’s a tips for last minute Halloween costumes: Turn to your closet! Sports wear. Grab some athletic tape and a hoodie to transform yourself into a boxer. Have a favorite sports star? Mimic their look with your workout clothes. Or wear all black and a beanie to be an on-the-go burglar. Jean Jacket. With this closet staple, you can easily become some recognizable characters. Grab a bandana to become Rosie the Riveter. With a puffy vest, turn your jacket into the wardrobe for “Back to the Future” Marty McFly. Whether you find a hidden gem in your closet or re-purpose last year’s costume, make sure it is clean and fresh before Halloween arrives. Hidden stains may have surfaced if the costume wasn’t properly cleaned before going into storage, so get out the costume early to check. For the best clean and care, bring your costume into our store in Highlands Ranch! Halloween costumes are often made from a variety of difficult fabrics, from polyester to velvet. Our cleaning experts will carefully handle even the most challenging fabrics for a fresh feel just in time for Halloween! If you have questions about caring for your costumes or removing pesky chocolate and sugar stains, call our experts at 303.798.0515. Happy Halloween! Fall is a busy time of year, with children in school, sports, and activities. Which is why we want to help make your weekly tasks a little easier. Break it up. Divvy up your laundry routine into smaller, more manageable chunks. One easy way to do this is with the sorted loads: whites, brights, darks, towels, jeans, etc. Pick one type to do each day, or set a schedule you can stick to. Plan a “laundry” day. The opposite approach works better for some. Planning one day each week to tackle all of the laundry means you don’t have to worry about it for the rest of the week. Multitask. Pair laundry with something more fun, like a good book or TV Show. At the end of each chapter, episode, or commercial break, check on your laundry and switch loads! Pick a podcast or movie to turn on in the background while you fold and hang the clean clothes. Pre-sort. Having dedicated baskets for each load can drastically reduce time spent sorting dirty laundry. As you put on pajamas at the end of the day, toss your dirty clothes into the appropriate basket! Sort carefully to avoid stains and mistakes, or check the baskets as you load the machine. Get the family involved. Instead of taking this task on yourself, ask for help! Young kids can help put clean clothes away, and older kids can help fold, sort, and hang. Clean washer and dryer. Your machines should be cleaned periodically to avoid getting contaminants on your clothes. Most machines have a self-clean setting, and be sure to remove dryer lint after every load. Pick-up service. When you’re too busy to drop off dry cleaning, give us a call at 303-798-0515! We offer pick-up and drop-off services to help you manage your busy schedule. With our organic wet cleaning, your clothes will be cleaner, fresher, and hassle-free! If you have any questions about caring for your clothing, call our experts at 303-798-0515. Autumn is in the air here in Colorado! Along with cooler temperatures, shorter days and leaves changing color, this time of year also means your wardrobe will be changing which gives you a good opportunity to do some cleaning out of clothes that are perhaps getting a little long in the tooth. When you open the closet door and feel overwhelmed at the task ahead, here are five tips for faster, more effective fall wardrobe maintenance. It’s easy to get overwhelmed by fall cleaning as a whole, so instead divide and conquer. Split your closet cleaning into a collection of smaller tasks and write them down to tackle one at a time. As we head towards cooler days, it’s time to put away swimwear and shorts. Before you do, bring them to Green Care Cleaners for a final cleaning to remove hidden stains and keep fresh for next summer. Do you have a tendency to hoard? It’s easy to hold onto clothing item that has sentimental value, but take a hard look at your wardrobe. If you haven’t worn the garment in over a year, it’s probably time to move on. Donate those pants that don’t fit and those band t-shirts from high school to charity and say goodbye to the items you no longer need. It’s easier to stay organized than to go through the entire cleaning process again, so make a good hearted effort to maintain your fresh closet. Now that you’re organized, it’s time to celebrate! Buy a special new garment or two, and bring your favorites into Green Care Cleaners to get them fresh, clean, and ready for autumn! As always, if you have any questions about caring for your garments, give us a call at 303-798-0515. Swimwear takes quite a beating in the summer. Whether you swim in the pool/natural water daily or just jump in every now and then for a quick dip, pool chemicals, the sun, sand, and lotions can all cause damage to swimsuits. This is distressing as swimsuits aren’t cheap, and the perfect one is often hard to find. Learning to properly care for your suits can lengthen their lifespan significantly. The following are tips to keep your swimwear looking good for years to come. Sunscreen, chemicals, and body oils can do damage to the material that most suits are made of. Rinse suits immediately after being in a hot tub or chlorinated pool. Besides protecting the integrity of the fabric, the quicker you rinse harsh agents out of your suit, the less likely your swimwear will smell like chlorine, the beach, etc. Always hand wash your suits rather than machine wash them. The agitation from washing machines can damage all the delicate parts of a suit, leaving things bunched, stretched, or otherwise ill-fitting. In fact, machine washing is probably the worst thing you can do to swimwear. Be sure to use a very mild detergent, such as a little hand soap or baby detergent, to wash your suits. Never use anything with lotions or moisturizers in it as they are damaging to the material. Turn your swimsuit inside out and submerge in water. Swish it around for several minutes and then rinse well. Never wring your suits out as this can damage the fibers of the suit and distort its shape. Lay your suit flat on a towel, roll the towel up and squeeze gently, then lay it flat to dry as hanging a swimsuit to dry can cause it to become stretched out. Also, avoid drying in the sunshine as this can cause the colors to fade, and never, ever put a swimsuit in the dryer. Spandex is a “memory fabric,” meaning it takes a full day to return to its regular form. Having more than one suit to wear means you give each one the chance to breathe and return to its original shape. Alternating suits also gives each a chance to dry thoroughly, reducing your risk of being exposed to the bacteria and mold that can grow from damp swimsuits. Hot water is bad for swimwear, and the combination of hot water and chlorine in a hot tub is even worse. Never use hot water to wash your suits, and avoid too many dips in the hot tub in your favorite suit. Instead, save an old suit, or your cheapest suit, for hot tub dipping. If you plan on spending a lot of time in a hot tub, choose a suit that is 100% polyester or chlorine resistant as cotton and natural fibers don’t hold up in chlorinated water. Prepping a new suit before taking a dip at the beach or in a hot tub can help lengthen the life of the suit. A 30-minute soak in a vinegar and water mixture (one tablespoon white vinegar per quart of water) should prevent dye from bleeding. Whether you’re sitting on the ground, on a wooden bench, or on some other rough surface, try to always sit on a towel. These surfaces can snag and tear material, causing it to look worn and old before it’s time. If you don’t have a towel handy, wrap up in a sarong or scarf when you leave your lounge chair or the pool so that when you sit down, the bottom of your suit is protected.